Could GUAM Lose Another Member To Become GUM? Like the Commonwealth of Independent States (CIS) against which it is arrayed, the GUAM Organization for Democracy and Economic Development has for years attracted attention less for what it is doing than for the fact that it has survived. Established in 1997 by Georgia, Ukraine, Azerbaijan and Moldova, this loose political grouping briefly included Uzbekistan as well. Some commentators have regularly insisted that GUAM is useless and on the brink of dissolution, but others argue that it has and will continue to play an important role in the future as a waystation for former Soviet republics seeking greater independence from Moscow. That debate again intensified in the last week, following meetings in Chisinau of the parliamentary assembly of the GUAM countries and then of the heads of their governments. Aleksandr Medvedev of the Moscow Institute of the CIS Countries took the lead in suggesting that GUAM is now in its death throes. In an article entitled “GUAM Is on the Brink of Disintegration” (Materik.ru, October 8), he specifically posits that the Chisinau sessions “did not lead to any breakthroughs in political and economic cooperation” among the member states. Instead, Medvedev continues, they highlighted the differences among them: three of the members (Georgia, Ukraine and Moldova) vocally expressed opposition to Russian policies in the region “and even in Syria,” while the fourth (Azerbaijan) did not use such “anti-Russian” rhetoric, he stresses. Moreover, on the basis of what Medvedev says were his talks with Azerbaijani officials, he suggests that Baku is anything but happy with the direction GUAM has taken and has effectively “frozen” its participation in the group—the first step toward an exit if Azerbaijan follows the same approach that Uzbekistan did. Back in 2002, Tashkent announced that it was “freezing” ties with what was then GUUAM and then left the group by 2005. He writes that Russian-Azerbaijani relations are too good for Baku to engage in GUAM-style attacks on Moscow: Vladimir Putin and Ilham Aliyev are close, bilateral trade is setting records, Azerbaijan is “one of the few countries in the post-Soviet space” which shows respect to the Russian language and Russian culture, and Baku is pleased by the warming of relations between the Russian Federation and Turkey. According to Medvedev, Baku “at the present time is not considering the possibility of leaving GUAM”; however, the leaders of Chisinau, Tbilisi and Kyiv “understand that Azerbaijan has de facto frozen its membership in the organization.” He goes on to describe GUAM as ever more anti-Russian and ever more an American cat’s paw on the territory of the former Soviet space. Yet, at the same time, the organization continues to rely on Russian as its working language, thus demonstrating that it is still part of the Russian world, whatever its leaders may think, Medvedev asserts. The editors of the Rex news portal, a group that typically takes Russian nationalist or even imperialist positions, has gone even further in its negative assessment about the future of GUAM. 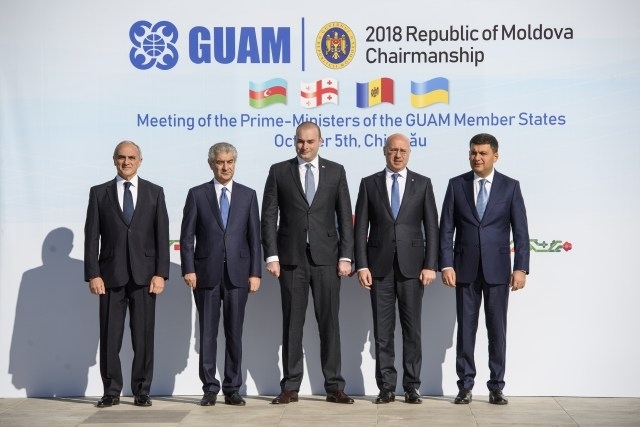 According to the outlet, “Moldova, Georgia and Ukraine are establishing a new anti-Russian, pro-NATO [North Atlantic Treaty Organization] alliance.” As a result, “GUAM in fact is now GUM, a group consisting of three countries that have been subjected to the strong influence and pressure of the Americans and that are being used to ‘contain’ Russia and have been forced to serve as places des armes for NATO” (Iarex.ru, March 7). Unsurprisingly, the editors gloss over the fact that two of these countries have been outright invaded by the Russian Federation and that portions of all three have been either annexed by Moscow or split off from the countries of which they remain legitimately a part - Transnistria in Moldova, Crimea in Ukraine, and Abkhazia and South Ossetia in Georgia. Svetlana Gamova, a specialist on the former Soviet space for Moscow’s Nezavisimaya Gazeta, also took note of the anti-Moscow comments in GUAM; but she draws a different conclusion about the future of the organization. On the one hand, she suggests that the group, by focusing on the issue of separatism, will attract more support than it has up to now by others who may feel similarly threatened. And on the other, hand it is clear that the tough positions the three westernmost GUAM states have taken will simultaneously win them more support from the United States and NATO and thus make them more attractive candidates for inclusion in the Western alliance, the goal of the governments and peoples of all three (Nezavisimaya Gazeta, October 4). For three reasons, then, GUAM is likely to survive and those who predict Azerbaijan’s departure are almost certainly wrong. First, Baku shows no sign of shifting away from its “balanced foreign policy.” It continues to work both with Moscow and with those opposed to Moscow. Leaving GUAM would undermine that approach, and consequently Azerbaijan is unlikely to take that step anytime soon. Second, international organizations enjoy remarkable staying power even when the world changes and powerful forces would like to see them end. GUAM has been around now for more than 20 years. It seems likely to continue and may even benefit from its new and tighter focus on the question of separatism. And third, like the CIS, GUAM will continue to be the object of speculation between those who see it on its death bed and those who believe it is destined to do great things in the future. That is what has just happened in the wake of the Dushanbe CIS summit (Central Asia Monitor, October 8). And the debate sparked by the recent GUAM meetings in Chisinau is no different.